Distance and time are realities for all mobile creatures. Most creatures deal with these realities intuitively. Humans learned to consciously plan for them. This "Prequel to the Thought Experiment" briefly reviews distance, time, velocity (distance per time), and acceleration (velocity per time). Inch - probable measure of average man's forefinger tip. Foot - probable measure of average man's foot. Yard - length of a typical's man's stride. While these measures are now rigorously standardized; this was not always the case. Just a few hundred years ago, local measures depended more on an average man's body parts then on an international standard. Since body parts vary considerably in size, these units of measure varied not only from country to country but even from village to village. Metric. About the time of the French Revolution, two French astronomers endeavoured to create a scientific standard of distance. (See Ken Adler's book, The Measure of All Things, a highly enjoyable read.) After years of pain staking and highly precise measurements, they determined a unit of measure now called the meter. Thus, a meter closely approximates one millionth of the distance between North Pole and Equator. In grade school, we learn that a centimeter (cm) is 1 hundredth of a meter, and one inch is equal to 2.54 cm. Day is defined by the duration of one rotation of the Earth . Time is the same in both English and metric. While distance can be expressed in many different ways, metric, English, nautical, etc., time is more universal. Seconds, minutes, hours, days, etc. are used by just about everybody. Thus, time is slightly more consistent then distance which must convert between different units of same systems as well as between different systems of measurement. However, all such conversions can be done with simple arithmetic operations. Velocity equals distance over time. (v = d/t) Via a simple procedure, one can readily convert velocities between different dimensions (example: from Int'l System's km/hr to British System's ft/sec and vice versa). Sidebar: Is speed different from velocity?? Academically, velocity is a vector quantity with both direction and amount, while speed is a scalar quantity which is only an amount. However, this article follows common convention which disregards this distinction and assumes same meaning. Walking Velocity. Consider a walking velocity, v = 1 meter per sec = 1 m/s. Recall that 3 feet is a little less then 1 meter. (3 ft = .915 m = 1 English yard). Recall that a yard was chosen as the length of average man's stride; thus, a brisk walking pace could cover about 60 yards per min = 3,600 yards per hour. Since 3,600 yards = 3 × 3,600 ft = 10,800'; then, one can readily estimate a brisk walk can easily cover 2 statue miles per hour. Thus, a walking pace of 1 m/s will exceed 2 miles/hr. Let's convert 1 meter per second (Int'l System) to equivalent miles per hour (British System). Fast Flying. Consider a more exciting speed, a rifle bullet has a muzzle velocity of about 1,000 feet per second = 1000 fps. What is that in miles per hour? ....km per hour? Slow Orbital Speed. Convert speed of a bullet to kilometers per second. 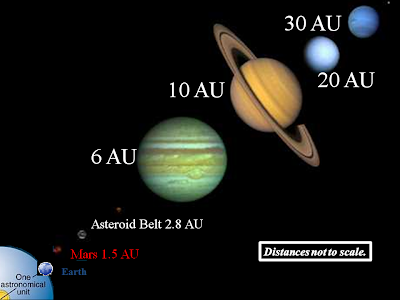 Typical speed of an asteroid/planet around the Sun is usually measured in km/sec and depends on the distance from Sol. For example, Earth's orbital speed is 29.8 km/sec and Mars orbits at 24.1 km/sec. Thus, a fast bullet would be a slow asteroid. CONVENIENT MEASURE OF INTERPLANETARY DISTANCE. Astronomical unit (AU) is a unit of distance nearly equal to the radius of Earth's orbit around the Sun. The currently accepted value is 149,597,870 km (about 150 million kilometers or 93 million miles). AU proves to be a convenient measure of distances within our Solar System. CONVENIENT MEASURE OF INTERSTELLAR DISTANCE. Interstellar distances require an even longer unit of distance. Commonly used is the light-year or lightyear (symbol: ly), the distance light travels in a vacuum in one year. The term "light year" makes more sense if one recalls that velocity times time equals distance (see below). A light-year equals 9,460,730,472,580.8 km (approximately 63,000 AUs). LY is a very convenient unit of distance for near by stars. Light-speed in a vacuum is an important physical constant denoted by the letter c (perhaps chosen from Latin word, celeritas: "swiftness"). "c" is the speed of all electromagnetic radiation, including visible light, in a vacuum. More generally, c is the speed of anything having zero rest mass. In metric units, c is exactly 299,792,458 metres per second (about 300,000 km/sec). Recall that distance is speed × time. "Light Year" is "c × year" = distance. Granting the convenient approximation of c = 300,000 km/sec; then, how long does it take for a photon, particle of light, to travel from the Sun to the Earth? Of course, it takes a year for that same photon to travel a light year (ly); thus, how many AUs in a LY? We know it takes 500 seconds for a photon to travel one AU. Since it takes a year for a light particle (i.e., photon) to travel one Light Year (LY), we can determine AUs per LY by dividing 500 seconds into total seconds per one year. For convenience, approximate l LY as 63,000 AU. After a year, a photon travels one light year (LY), about a quarter of the distance to the nearest stellar system, Alpha Centauri. VELOCITY CHANGE PER UNIT TIME. Recall that velocity is the amount of distance traveled in a given period of time (distance per time). Any change in velocity requires acceleration; when decreasing velocity, one must decelerate (deceleration can be considered negative acceleration). We all experience acceleration daily when we travel from our home in our automobile; we must enter the vehicle when it's at rest (0 mph). After we strap in, the driver steps on the fuel peddle; and we accelerate (increase speed) to perhaps 60 mph. Similarly, when we reach our destination, the driver steps on the brake to decelerate (decrease speed) to 0 mph; then, we unstrap our safety restraints to exit the vehicle. Newton stated that objects travel at a constant velocity until acted on by an external force. Virtually all scientists have long accepted this as true. This seems counter to our daily experience; for example, when our car is at 60 mph, we'll slow down as soon as the driver takes her foot off the fuel peddle (also know as "accelerator"). Does this prove Newton wrong?? Quite the contrary, he's proved correct; the vehicle will slow due to external forces such as air resistance and road friction. For convenience, round 9.8 m/sec2 to 10 m/sec2; this will facilitate further discussion on more thought experiments. That's to say, at 0 seconds, its downward velocity is 0 m/s; at 1 second, it's 10 m/s; at 2 secs, 20 m/s, and so on. Thus, velocity increases 10 m/s for every second of free fall. Expressed as an equation: velocity = acceleration * time (v = a * t); if we're considering only the acceleration caused by gravity near Earth's surface, then we can substitute g for a.
how fast are we after 10 sec?? Construct a simple table using arithmetic progression. Simply increase speed 10 m/sec for every second elapsed. after 10 seconds, velocity is 100 m/s . g = free fall acceleration due to gravity near Earth's surface. Recall that 1 meter per second (m/sec) is 2.25 miles per hour (mph), a brisk walk. Ten times as fast (10 m/sec = 22.5 mph) is the speed of an automobile in slow traffic. A free falling object gains this much speed in one sec. In ten seconds, an free falling object's speed (100 m/sec) is 225 mph. Following table reviews even higher speeds as well as a simple conversion technique. It's easier to appreciate meters per second if you know their equivalent speed in miles per hour. In one minute, g-force acceleration can take us to over 1,000 mph. Only a few aircraft can achieve this speed. To convert any velocity from meters per second to miles per hour (mph), just multiply by 2.25, relevant conversion constant. Our thought experiment will mostly use g= 10 meters per sec per sec. However, we could use English units to express same value. Recall a more precise metric g value is 9.8 meters/sec/sec and 1 ft = .3048 meter. Since acceleration is velocity per time, also express as distance per time squared (i.e., m/sec2)? Acceleration equals distance divided by time squared. Thus, acceleration is often used with units m/s2 or meters per seconds squared. If a notional spaceship could achieve g-force acceleration, it would gain a final velocity of 864 km/sec after one day. 864 km/sec is about .005c (one half of one percent of light speed). For this first day (or D1) of g-force acceleration, the average velocity is 432 km/sec. Thus, first day's total distance, d1, is about 1/4 AU. Precisely at end of day one (D1), let our spaceship cease acceleration and maintain a constant velocity of 864 kps for the entire 2nd day (D2) of spaceflight. Thus during D2, the spaceship will travel distance, d2, about one half of an AU. Thus, a spaceship with a g-force acceleration capability could conceivably accelerate for D1 and travel 1/4 AU; during D2 , travel at constant speed, 864 kps, for another 1/2 AU. During third day, D3 , g-force deceleration will enable spacecraft to travel same distance as first day. Thus, a g-force vessel could conceivably travel 1 AU in three days. Thus, one could often travel between Earth and Mars within three days. Their orbital positions are often within an AU of each other; otherwise, trip might take a little longer. For more about g-force acceleration, see Thought Experiment's next chapter, "Accelerate for a Day".